Generally, the cuisine of Uttar Pradesh is as diverse as its geography. Jaunpur is no different from rest of the Uttar Pradesh ranging from simple everyday-fare to rich elaborate banquets. In order to create a complete feast of wonderful dishes with the most popular being the Awadhi delicacies, the cuisine of Jaunpur has adapted a variety of cuisines to create a delicious feast. Though the awadhi cuisine has a striking resemblance to that of Mughlai cuisines, except that the former uses lesser amount of cream and spices. 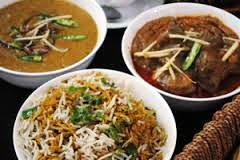 You can find and enjoy all kinds of Awadhi delicacies in Jaunpur. While the Mughals preferred tandoor style of cooking, awadhi cuisine is mostly made with the help of tawa. It is ideal to know about the utensils used in Jaunpur for awadhi cuisines are Mahi tawa, seeni, lagan, Bhagona or patili, deg or degchi, lohe ka tandoor and kadhai. Some of the delicacies of awadhi cuisines are kebabs, galavati kabab, kakori kabab, shami kabab, pasanda kabab, nahari, murg mussalam, rezala, kundan kaliya, shahi korma kaliya, badal jam and rice platters are noor mahal pulao, zarda, sheermal and breads like sheermal and desserts like halwa, kheer, mazaffir and malida, etc. Most of the Hindu communities in Jaunpur are staunch vegetarians and their cuisine involves purely veg dishes ranging from “Aloo-puri” or potatoes, fried wheat bread to savourites, divine deserts and sweetmeats. When it comes to delicious delicacies, Nawabs of oudh were great gourmets and encouraged their master chefs to create new styles of cooking similar to that of “Dum Pukt” of Lucknow where the food is sealed inside a large pots called ‘Handis’ and placed over a slow fire and left it to be cooked on its own juices. Once it is cooked and opened, it releases the most fragrant and delicious aromas.